I recently did a Googlebomb post over on the Google Public Policy Blog. I’ve talked about Googlebomb phenomenon before (also see more Googlebomb background here). Just as a reminder, a Googlebomb is a prank where a group of people on the web try to push someone else’s site to rank for a query that it didn’t intend to (and normally wouldn’t want to) rank for. Typically these queries tend to be unusual phrases such as “talentless hack” that don’t really have any existing strong results. 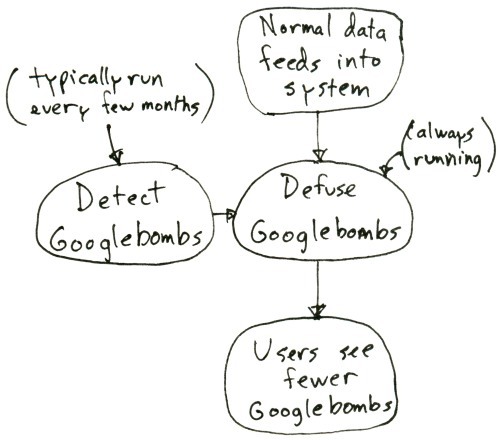 The defusing algorithm is running all the time, but the algorithm to detect Googlebombs is only run occasionally. We re-ran our algorithm last week and it detected both the [failure] and the [cheerful achievement] Googlebombs, so our system now minimizes the impact of those Googlebombs. Instead of a whitehouse.gov url, you now see discussion and commentary about those queries. Harith, we did re-run our algorithm because of the discussion of Googlebombs last week. But if the detection algorithm hadn’t detected those caught those Googlebombs, we wouldn’t have changed anything manually. What happened there is we re-ran our algorithm in December 2008, and at that time the detection algorithm didn’t flag [failure] as a Googlebomb. We don’t claim that our detection algorithm is 100% perfect; for example, that can happen because the link structure of the web does change over time, as does how we crawl the web. To me, the December 2007-to-January 2008 behavior for [failure] is pretty good evidence that we run our algorithms and then stick with the output of those algorithms. I see googlebombs as mostly harmless that only gives the perpetrator some self-satisfaction. I wish Google would give this much attention to the “SEO professionals” who use dodgy practices, rather than punishing their victims (the Webmaster who has paid). Dave (originial), this seems to be a topic that captures peoples’ imagination — Danny’s post about Googlebombs was one of his most popular in 2007, I think. So in the interest of transparency, openness, and better communication, I wanted to answer the questions from this most recent round of coverage. Sorry but my “anti-bomb”, – I never knew an antonym (i’m french speaking)-, was only to celebrate the new president with a little wink. I make no interview on it, and my only purpose to do this was to do an anti-bomb to celebrate Barack and all the people of US who elected him and give a little boost at the gloom about politician here and probably at US too. Google Boms are collaborative projects of web 2.0. I think that defusing google bombs is the same of killing the freedom of speech! If a site is trying to attempt a Google Bomb, it can be penalized by Google’s Algorithms? i think Google shouldnt work against “Googlebombs” because they are a piece of Democracy on the Web. If a group of People think that someone did a “miserable failure” or seems to be an “Waschlappen” and they are setting some Links to the Page of this Person for getting him ranked for this specific Keyword its similar to an wildfire. But this are just my 5 Cents to this topic. I would be glad if you can give an response to my Opinion. Google bombs sound to me like people who have to much time on their hand. If someone is a hack there are plenty of whistle blowing website that can do a great deal of damage. Should the Google Bomb detection algorithm pick up on sites like http://www.moneyexpert.com which currently ‘bombs’ keywords like “mortgages” and “remortgages” its way 26 million links (looks like through a spam link share network) and gets rewared with 1st page visability for highly competative terms in the UK? Has anoyone ever noticed similarity between graffiti bombing (1000s of pieces of graffiti art using the same word) and google bombing (1000s of links using the same word)? Re: The ethics of keeping Google bombs in the system… perhaps if it happened naturally it would be fine (Bush was indeed pure undiluted failure) – perhaps it is the act of people acting to intentionally distort the results that makes it something G. cannot tolerate. Hi Matt, giving the ‘cheerful achievement’ type nonsense the label of a ‘bomb’ is only going to encourage it. I’ve tried to point out that this isn’t a ‘bomb’ but some basic SEO – anchor-text keywords – on a Pidgin English expression that was virtually non-existent on the web before the 22nd January. Getting a good result under those circumstances is way too easy. Good luck to Eric Baillargeon for the publicity he generated, but this was no Bomb! Matt, as I did two years ago, I’ll point out for you that the Googlebomb is STILL in effect despite Google’s tweaks. “Failure in the white house” and “white house failure” still serve up President Obama’s page, as they served up President Bush’s page for the past two years. The algorithms appear to be too simplistic. Makes sense, Matt, and similar to what Google has said before. But why did failure start working when miserable failure didn’t? It was all systems working fine to keep miserable failure from going off and has been since the fix was put into place. That fix also kept failure from going off with the one exception being when the Bush page itself used that word. Then earlier this month, I noticed failure was ranking the page again. It might have been doing that even longer — I just hadn’t checked. Your system already knew that failure was a bomb, had defused it, but then somehow it went off again? Why? Eric Baillargeon, no hard feelings, and I think the people that liked the [cheerful achievement] Googlebomb enjoyed themselves for a few days. But by the goals that we’ve set for ourselves, Google can’t pick or choose which Googlebombs should be defused. That’s why we run our algorithm and use the results of that algorithm without making any manual changes ourselves. Dave (originial), the vast majority of my time is spent tackling those dodgy practices, not on issues like this. Salvy, these queries still return discussions about the Googlebombs, just not the Googlebombed pages themselves. Firestarter, normally it tends to be a small number of people that attempt a Googlebomb, not a huge amount of people. Thanks for detailed reply. Highly appreciated. Though some kind friends here see Googleboms as funny or democratic thing, I see it as vicious webspam. Its aim is to make pages rank for keywords they are not suppose to rank for. As such those who practice Googlebombing are spammers/blackhats. I just wish Google had put as much effort into protecting Bush from Googlebombing as they did for Obama when they quickly intervened to defuse the old Bush Googlebomb. That bias was totally unfair and disrespectful of a sitting President who, in spite of incredible odds, was successful in protecting the nation from a second terrorist attack (among other notable accomplishments if one objectively looks at the issues). It is wrong, I feel, for Google to show favoritism when they are supposedly neutral in delivering and indexing the world’s information. Bush and Obama both deserve a fair and honest presentation. Let the reader decide which leader, if any, is a failure. @Harith: give a penalty to someone who links to someones page with a keyword he thinks it would match the owner or products of this page ? No, you cant do that. If i want to link to someones page with “somekeyword” because im convinced that the owner or the product of this page is “somekeyword” – than this is my freedom of speech. Of course its the freedom of Google to give no Linkpower to the page, thats ok.
Matt, sorry, had missed the answer about why failure started working in your comments, that when you reran the algorithm, it didn’t flag “failure” as a Googlebomb. Matt, I’m not talking about time spent, rather the fact that Google appears to always take a bottom-up approach to Webspam (banning the clients of dodgy SEO companies-treating the symptons), rather than the SEO company (Top-down approach-treating the disease). Why? I asked Danny Sullivan the following earlier “when did America lose the honor, dignity and respect for the Oval Office?” Please understand, I’m not focusing this at you, Matt, but it’s frustrating that it distracts from the work at hand. In the early 1990s I was involved in the anti-virus / anti-hacking scene with John McAfee. This topic is very similar to the “false negative, false positive” virus report issue we debated back then. There too, the golden rule fell on deaf ears. Hmmm. We’ve become so sophisticated, and nothing has changed! I love the idea of a googlebomb for the same reason as I love conspiracy theories, it’s like david pulling a little prank on Goliath – it might not hurt too much but David feels better. I guess this is a tough one. Googlebombs need to be clearly defined. What constitutes a Googlebomb? Is it the result or the intent? I don’t see how “failure in the white house” is any different from “click here”. Could it be that Google simply puts too much emphasis on anchor text? People saw GW Bush as a “miserable failure” so why is that defined a Googlebomb? Or even when the “dangerous cult” lead you to the Church of Scientology that was diffused as a Googlebomb. But “click here” still hasn’t been flagged. There could be many reasons for that but if “click here” doesn’t qualify as a Googlebomb, even unintentionally, then I just don’t know. Good points, Robert. I too see googlebombs as hightlighing a flaw in Googles algo rather than a problem on the Web. I would LOVE to see Google defusing sites with tons of keywords stuffed into it in the same manner–the ones ranking just above my sites! 🙂 What google is doing with the googlebomb diffusion is stopping personality branding or so I would call it. Gotta be nice out there! You never know when an SEO with too much time on his/her hands will drive unwanted traffic to you and cause unwanted rankings. There is nobody out there that I dislike enough to bother spending the time to do something like this. Great post Matt. I learn something everytime I come here. It seems to me that “Google Bomb” is just referring to the google ranking system reflecting popular oppinion, which is what it is all abuot … isn’t it? If a bunch of people write copy about someone being “hopeless” and link to them, then there is probably a reason that this person should rank for the term “hopeless”. What about when a competitor googlebombs you for the words you are actually targeting in order to penalize you. How long is the penalty or filter, what happens if your site is believed to have been ‘googlebombed’? I have 2 website, first is a simple generalistic portal and second is a cms multiplatform blog, this brands are linked, are is same logo but domains name is different. My question is: if insert a same link from blog platform (70000 web pages) to second domain name (portal) this is googlebomb? I can receive a penality from googlebot? Google bombs are different from random linking. They are organized attempts to manipulate the search results. In that way they are like web spam or black/grey hat seo. I agree that they don’t merit penalties, but if they became more prevalent or malicious, I would not be surprised if the response was to minimize the power of the pages with bombs. But as currently practiced, they are just a good bit of fun and they only target keywords that are not competitive. The folks at Cheerful Achievement Taxidermist Shoppe may disagree though…. Matt Cutts: Gadgets, Google, and SEOThis site may harm your computer. HI Matt, me too, I see just a couple of minutes ago when I searched for any keyword, all of the results contains “This site may harm your computer”. We were worried, may I asked what’s the problem with the indexes today? I think that was an error that was fixed before the week started. Found it on the Google blog. Anyway, I think it is awesome that Big G has decided to fix the Google bomb issue. I just think that is it wrong to use such a popular medium such as the search engines to attack such a respected office as the presidency of the United States. I know that people will always find a way to go around the algo that detects it, but it is good that effort is made to minimize those. As for those ranting about free speech, there are hundreds of other media they can use. Though, failing at it at times, I think Google is doing good in keeping its results bias free and objective. So “Google Bombing” is the process of attaching set keywords in Link Text (and Link Context? ), with the aim of causing the destination of that link to rank for that term… right? So how does Google figure out the difference between naturally occurring mass linking due to quality/popularity, and “Google Bombing”? Based on content of the destination not matching the link text? What if I’m happy for my site the rank for “utterly mallow” or “stupid bunny” ? So it’s programmed to spot negativity and undesirable terms? So it’s programmed to spot terms that do not match the page content/context? Can I not rank for “thesdfoewrwemrw” without Google deciding I shouldn’t? What if it’s a hip new term new to the world? I get a ton of links because people think the sites ‘just, well, “herring” man! ‘ … and G decides that I’m not so “herring” and drops me for that term? If thats what the public wants to do (the same public Google serves, right?) … then why remove that rather public vote? Those rather silly aspects aside…. Why is it that Google will go to such lengths for this sort of thing – but NOT simply drop shoddy sites from the Index? You state it is against your ToS/Guidelines to manipulate the rankings etc… particularly with links – but I can do a search on buying links and get tons of results! Sorry – but I fail to see the logic behind this form of thinking. I have been working with computers since 1957 and have been surfing the internet since Al Gore invented it. (LOL). I fail to see how anyone could gain satisfaction from purposefully “bombing” someone whether it be a person or a website. What type of public mindset hve we developed here anyway? Unfortunately when there is a lot of money on the table, there will always be strife. It is worth millions to companies to be highly ranked on Google. There are some evil beings at work to take high ranking sites down for their own satisfaction and gain. Thanks for helping protect us Matt. As has been stated, googlebombs can be very good for pointing out some things, but there is far too much room for abuse of the system to allow the practice to exist, even it is is “cute” and “funny” a lot of the time. The question for the web graffiti terrorists^H^H^H^H^H^H^H^H^H^Hartists is, how do we get around it? I am registered for the conference next week and you are listed as evaluating Web sites. I would dearly love to have mine so evaluated. It is non-commercial though I have Google Ads for about a year now. Basically it is an unaffiliated learner-centric educational public service targeting middle school through returning adult learners. It is translated into 30 languages by volunteers, and has 80 interactive exercises developed by students for students. I ahve several goals: one to add the ability on each of the 3,000 or so pages to be able to tanslate with this Google functionality, another to give learners the ability to join groups in discussion groups by topic. can you advise me on how to submit my site for this evaluation? I second to that. I’ve had bad experiences from the so-called “SEO professionals.” There was also an instance where “unknown” links starts building up in one of my ranking niche. Is there a way for Google to find out links that are organic and those built to harm a competitor’s site?